A template contains groups and channel list you can customize to your needs. Once you have created a template, you can create lines and connect to this template. These lines then get exactly these groups and channels you have defined in the template but need their own credentials. The credentials from the template will not be distributed. These only need them so that the template can synchronize with the server. That's why it's important that you always have valid credentials there. 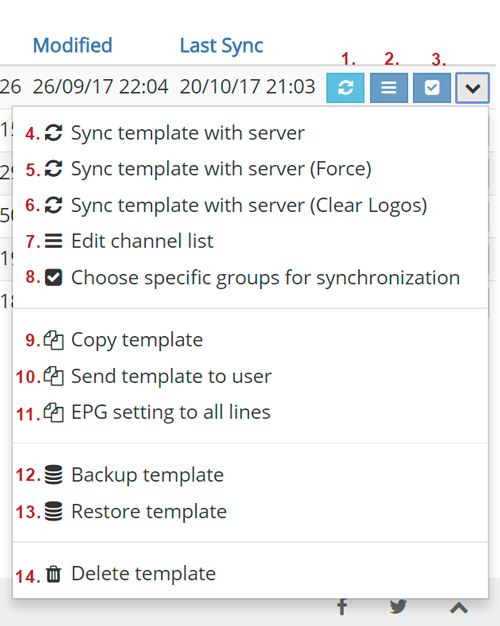 Instead of synchronizing each line individually with the server, you can create a template and connect as many lines as you like. The lines are always up to date. Nothing is streamed here. Each line needs valid credentials from the provider. You can only make an template if your provider uses Xtream Codes Server software. If you have received a link from the provider that looks something like this (http://server.extension:8080/get.php?username=123USER123&password=123PASS123&type=m3u_plus&output=ts) then you can create an Template. In this link you have all the information to create a line. I take as example this link. Click on the button "Add template" in the dashboard. You can now fill out this form with the information from the link. Server URL of the providers. Without further parameters. Ex: "http://server.extension:8080"
With this setting, your list is synchronized daily with the M3U source. Synchronization is initiated with a download of the list. With this setting, your list is synchronized daily with the M3U source. Synchronization is triggered by our task scheduler after 24h. With this setting, the channels removed by the provider are automatically deleted. This option allows you to generate a channel in the M3U list 10 days before the subscription expires. This should warn the user that his subscription expires soon. This option allows you to generate a channel in the M3U list after the subscription expires. This should warn the user that his subscription has expired. Click on "Save". You get back to the dashboard. Your template will now sync to the server for the first time. Please remember. The EPG-ID assignment is very important. Otherwise, the lines get no EPG data. If you click on the "Title" in the overview you will get the template settings page. (1) With us the lists of providers are cached for 1 hour. Otherwise the firewall at the provider would block us because of too many requests. If you click here, the list will still be loaded directly from the provider. Please use only when needed. (2) Same as (1) but since the picons are reloaded by the provider.